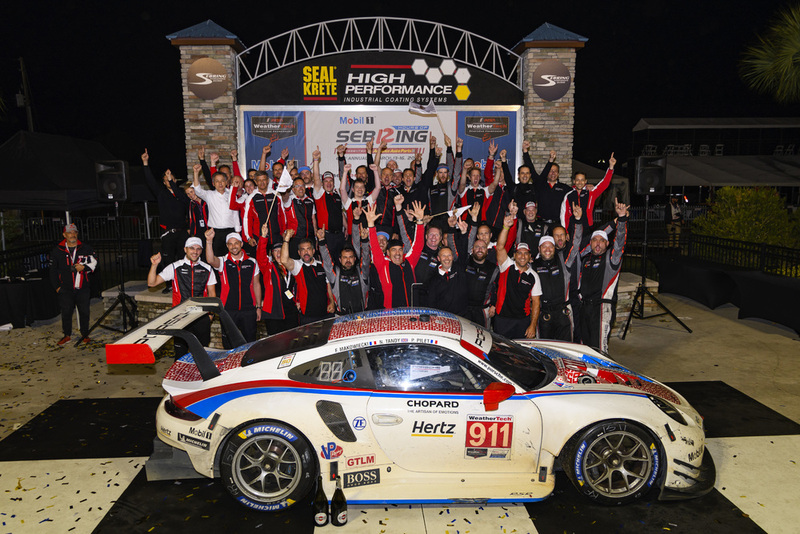 Porsche has notched up yet another victory at the “Super Sebring” race weekend. Nick Tandy (Great Britain) and his French teammates Patrick Pilet and Frédéric Makowiecki took the flag in first place in the Porsche 911 RSR at the twelve-hour race of the IMSA Weathertech SportsCar Championship. With this success, the trio in the No. 911 car has not only repeated their win from last year but also rounded off an extremely successful weekend for Porsche. A day earlier, the ca. 510 hp racing car from Weissach had won both GTE classes at the 1,000-mile race of the Sports Car World Endurance Championship WEC. The No. 912 sister car driven by Earl Bamber (New Zealand), Laurens Vanthoor (Belgium) and Mathieu Jaminet (France) finished the thrilling long-distance classic in the USA on fifth place. Early on in the race, lack of grip in the heavy rain initially threw both Porsche 911 RSR down the field. As conditions improved at the half-way point of the race, the experienced Porsche GT Team utilized every last strength of the car. Thanks to great tactics, top-class driving and flawless teamwork, the No. 911 car fought its way back into the lead. In a gripping finale, Nick Tandy fended off all attacks and crossed the finish line after twelve hours with a 1.951-second lead. Tandy, Pilet, and Makowiecki are the first driver trio to win the IMSA race at Sebring twice in a row. Thanks to their victory, the No. 911 crew now ranks first in the overall classification. The No. 912 line-up fell back two laps in the early phase. Putting in a spirited charge through the field, the Daytona podium finishers concluded the race on fifth. In the GTD class, the Porsche 911 GT3 R fielded by the Pfaff Motorsports customer team held the lead for about half of the race distance. The rewards for this strong performance from Porsche development driver Lars Kern (Germany) and his Canadian teammates Scott Hargrove and Zacharie Robichon were few. While switching out a faulty sensor in the 500 hp GT3 racer from Weissach, the squad lost crucial ground and reached the flag after twelve hours in tenth. Prior to this, the trio had held a comfortable lead over long stretches. In the identical vehicle run by Park Place Motorsports, Porsche factory driver Patrick Long (USA) and his compatriots Nicholas Boulle and Patrick Lindsey narrowly missed out on climbing the podium with sixth place. Round three of the IMSA Weathertech SportsCar Championship will be contested on 13 April in Long Beach (USA).